Bravo III outdrive, 2002 Regal 2465 Commodore, 27 ft practically new, the hull has very low time and the motor (mercruiser 5.0L 260hp with bravo III outdrive) was rebuilt in May 2007 and has very low hours on it. Due to the owners location, the boat has not been used since May 2006. 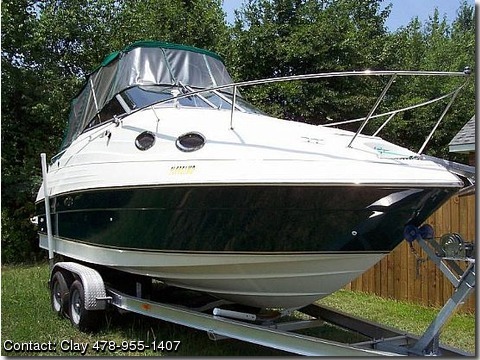 Instead of having the boat sit, owner has opted to sell. The cockpit features a walk thru transom door, u shaped aft seating area with removable aft seat and a double wide helm seat with a pop up leaning bolster. The helm area features a wood steering wheel, compass, depthsounder, Garmin gpsmap 230, bottom machine/fishfinder. vhf two way radio, burlwood dash panel, plus molded in steps providing easy access to foredeck. The main salon absolutley maximizes every inch. Forward berth has built in storage, plus converts to a comfortable dinette. Cedar locker, Kenwood cd player, full galley and enclosed head compartment round out the amentities. Access to the mid cabin is extra large. Twin portholes with screens create a natural and comfortable cross ventilation. There is a stand up head compartment in the 2465 that contains a stainless steel sink, hot and cold pressure water(16 gal fresh water tank), shower nozzle, generous storage and a marine head with 12 gal holding tank. The cockpit refreshment center features a sink and drinkholder. Underneath you'll find a conventiently placed, removable cooler. Transom has a fiberglass dive platform and fresh water shower. 68 gal fuel capacity. Owner willing to deliver anywhere if buyer pays for fuel cost.